Obesity-related disorders, such as metabolic syndrome (MetS), type 2 diabetes mellitus, and nonalcoholic fatty liver disease (NAFLD), are on the rise largely due to poor lifestyle in that diets often contain excess energy in association with limited intakes of essential nutrients, including the antioxidant α-tocopherol. Both healthy individuals and those with MetS have poor dietary α-tocopherol intakes that are substantially lower than the RDA; the latter also have compromised α-tocopherol status based on their lipid-normalized concentrations of circulating α-tocopherol. Dysregulated physiological responses, including altered trafficking along the gut-liver axis, in MetS persons further contribute to inadequate α-tocopherol status and provide rationale for increased attention to establish specialized dietary recommendations. α-Tocopherol supplementation at pharmacological doses shows promise in the treatment of MetS-related metabolic disease, including NAFLD. 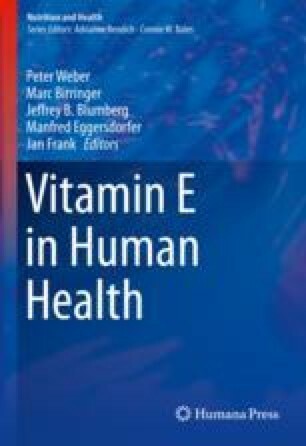 Thus, scientific focus on metabolic aberrations in relation to vitamin E intake, pharmacokinetics, and status may be a more appropriate approach to evaluate α-tocopherol requirements in relation to its health benefits. This chapter will discuss metabolic aberrations, with a focus on MetS persons as a clinical model, on dysregulated α-tocopherol trafficking and catabolism in relation to health benefits and dietary requirements. A sincere thanks to Katie England, MS (The Ohio State University, Columbus, OH), for providing editorial assistance. This work was supported by the Ohio Agricultural Research and Development Center at the Ohio State University (Columbus, OH) and a grant from the National Dairy Council. U.S. Department of Health and Human Services, U.S. Department of Agriculture. 2015–2020 dietary guidelines for Americans [Online]. 2015. Available: http://health.gov/dietaryguidelines/2015/guidelines/. Accessed 6 Dec 2016. Freisling H, Noh H, Slimani N, Chajes V, May AM, Peeters PH, Weiderpass E, Cross AJ, Skeie G, Jenab M, Mancini FR, Boutron-Ruault MC, Fagherazzi G, Katzke VA, Kuhn T, Steffen A, Boeing H, Tjonneland A, Kyro C, Hansen CP, Overvad K, Duell EJ, Redondo-Sanchez D, Amiano P, Navarro C, Barricarte A, Perez-Cornago A, Tsilidis KK, Aune D, Ward H, Trichopoulou A, Naska A, Orfanos P, Masala G, Agnoli C, Berrino F, Tumino R, Sacerdote C, Mattiello A, Bueno-De-Mesquita HB, Ericson U, Sonestedt E, Winkvist A, Braaten T, Romieu I, Sabate J. Nut intake and 5-year changes in body weight and obesity risk in adults: results from the EPIC-PANACEA study. Eur J Nutr. 2017; https://doi.org/10.1007/s00394-017-1513-0.